The first encounter with Lionfish off our coast occurred just north of Miami in the mid 1980s. Lionfish are not a native species in our coastal waters of the South Atlantic and Caribbean seas. As such, they have very few, if any, natural predators to control their explosive population growths. 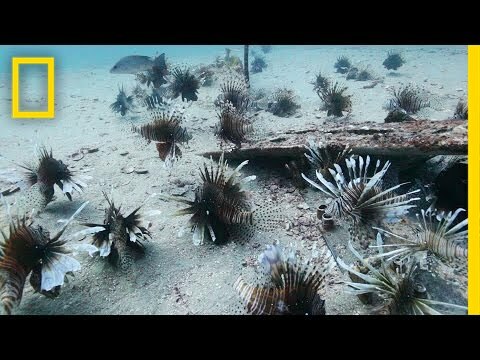 Lionfish is an invasive species that is thriving off our coast. They can rapidly increase in population and their eggs can be dispersed over large distances via ocean currents. Having not many predators and the fact that they are voracious eaters of our native reef fish, they are having a devastating effect on our local reefs. Very little is actually known about lionfish and researchers are collaborating with local fishermen who are eager to help. As of now, the best way to control the lionfish populations is by encouraging recreational spearfishing and the development of commercial interest in lionfish. Basically, the consumption of lionfish as a more popular staple of our seafood diet is the best way of controlling their population growth. Fortunately, for us, lionfish taste great and word is catching. There are stories of restaurants that feature lionfish as “the catch of the day” having long lines and lack of enough supply to satisfy their customers. So continue to spread the word. Increased consumption will ultimately help keep lionfish populations in check. Watch the following video for additional insights into this problem. It may help to remove some of the regulations from hunting LionFish. I come to the Keys every year. Have been diving for over 26 years. I am told I can’t spear Lionfish unless I purchase a fishing license and pay to take a special class on hunting them. Yes, I agree… However in a way, perhaps some measures are required to protect divers that handle lionfish.